After winning the silver medal in the men’s marathon event at the 2016 Olympic Games, Ethiopian Feyisa Lilesa went to the United States. He has lived in exile there for the last two years. Now, he has decided to return home. Feyisa decided to go back to Ethiopia after two athletics organizations told him he would be welcomed as a hero when he arrived. Ashebir Woldegiorgis, the president of the Ethiopian Olympic Committee, told VOA that the call for Feyisa’s return is meant to better the country. “He can teach his exemplary ways to other athletes and teach strength to our youngsters,” Ashebir said. Feyisa made international news at the Rio de Janeiro games when he crossed his arms above his head after finishing the race. The move was a sign of support for anti-government protesters in Ethiopia. Feyisa made the same sign when he received his silver medal at the 2016 summer games. 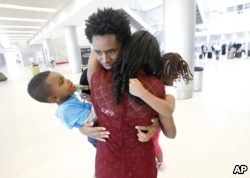 Olympic silver medalist Feyisa Lilesa, rear, of Ethiopia, hugs his wife Iftu Mulia, his daughter Soko, right, 5, and son Sora, left, 3, while picking up his family at Miami International Airport, Feb. 14, 2017. At the time, Ethiopia was moving towards declaring emergency rule. Violent demonstrations were spreading across the Oromia area of Ethiopia. Ethnic Oromos were protesting oppression and other human rights violations. After the games, Ethiopia’s information minister at the time, Getachew Reda, congratulated Feyisa. He also guaranteed the athlete that it was safe to come home. But, Feyisa used a special-skill visa to go to the U.S. instead. He settled in Flagstaff, Arizona. Six months later his wife, son and daughter joined him. While living in Arizona, Feyisa continued to publicly discuss the human rights situation in Ethiopia. He also continued training. “There were times when things were happening, and I wrote things from my inner thoughts, not because I have skills, but [because] people take my message and share it,” Feyisa told VOA. “But I am an athlete, and I am not that appealing. But when I write what I feel and people share, I am happy with it,” he added. Haile Gebrselassie is a retired Ethiopian runner and winner of two Olympic gold medals who now serves with the Ethiopian Athletic Federation. 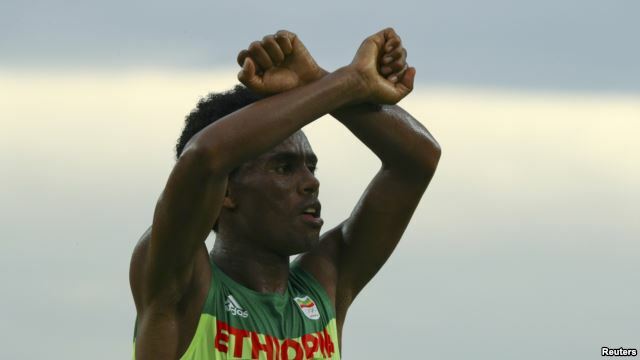 He told VOA that the decision to invite Feyisa back was connected to the athlete’s willingness to take a stand. Ashebir Woldegiorgis expressed similar praise. He said Feyisa raised his voice at great personal risk. Ethiopia has reached out to several other exiled citizens. Since the state of emergency was lifted in June, the government has removed several groups from its list of terrorist organizations. A delegation of Oromo Liberation Front members even visited the capital, Addis Ababa, Tuesday. Last week, the group agreed to end hostilities with the government. Salem Solomon wrote this report for VOANews.com. Phil Dierking adapted it for Learning English. Caty Weaver was the editor. Do you think athletes should be able to protest their government at the Olympics? Write to us in the Comments Section or on our Facebook page.